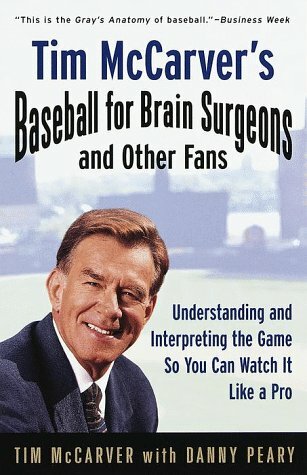 I have to start this blog with extremely sad news.......Tim McCarver has signed a 2-year extension with Fox. Yes, yes, I'm upset too. So sports fans, we're going to have to hear Tim's obvious bias and his constant and condescendingly belaboring of a point for 4 innings for 2 more years. So a whole mess of teams are interested in Kevin Kolb now that the lockout might be drawing to a close. i would like to see Kolb go to San Francisco and work with Harbaugh out there. That seems like it would be a good fit for both. Let's just say this. A college kid like Adam Morrison who gives all of his hearty and soul to try to win a game in March Madness—crying is ok. Some big shot who 'takes his talents" to a city and then things don't turn out to his liking—crying is not ok.
Really interesting article in the Hardball Times about Tim Lincecum and his diminishing velocity. Go read it, especially if you are a stat-head and love looking at numbers. Nice article on ProFootballWeekly regarding DE/OLB tweeners. The magazine synopsizes a few of the tweeners and where they end up. Good stuff. Been seeing a ton of mock drafts around the web with Cam Newton going first to Carolina. Said this before, I just don't see that happening. Sure they need a QB, but Cam—despite his physical talents—is a work in progress. He's not gonna Peyton manning the team—just walk in and start. Carolina has a myriad of needs, Cam Newton shouldn't be their priority. Unless Derek Jeter completely falls on his face this spring and eats it, Joe Girardi won't move him from the one-spot. As much as I would like to have Brett Gardner in the leadoff position, Girardi is a loyal guy and I can't see him moving Jeter. I like Gardner's speed and his better OBP—in point of fact, Gardner has a .529 OBP to Jeter's .389 this spring and has 2 SBs to Jeter's goose-egg—but can't see Gardner moving up until Jeter totally bombs up in the one-spot. Carlos....you've played in like 140 games the past two years. You batted .255 last season. You made like 1115 million over your career. And your knees still hurt. make sure this is your last year, dude. Go home and enjoy the money. Love to see A.J. Burnett doing so well and feeling so good in Spring Training. Now let's see this in July. OK, A.J.? As a March Madness fan and a Big East guy, today is a great day...the start of the Big East tournament. And with 10 teams in the mix for the Dance, this is going to be a great Big East tournament. Call in sick and get your couch on to watch this one. And finally, is it me, or is this statue of Nick Saban down at the U. of Alabama just really, really creepy. 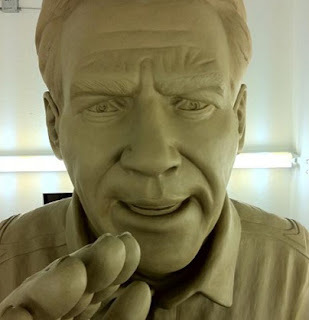 That statue doesn't look anything like him. Well except maybe the po'd expression. The Lincecum article was interesting. And he seems to be adjusting to the fact that his fastball has lost some velocity. Can't wait for Tim to tell me how the world works for 2 more years. Yippee! I'm not sure that I believe the crying story. It seems that the Heat are trying to generate a little drama and manipulate the world into thinking that they're not just in it for the money. Carolina should look into Kevin Kolb, too. There is defensive talent in this draft and while their offense was abyssmal, but why not take Bowers to improve their pass rush? Or one of the DT's out there? They only had 31 sacks last year and had one of the worst rushing D's in the NFL. Newton is a risk. Beltran is such a good player, but gimpy knees tend to get worse, not better. The Big East Tourney...I get goose bumps, too. That statue conjures up images of Lenin and Chairman Mao. It is truly disturbing.